In case you were wondering if it’s possible for Discovery Cove, the all-inclusive day resort in Orlando, to become more laid back and more exciting at the same time, the answer is a solid YES. Thanks to the introduction of new Relaxation Massages, a day at Discovery Cove can become even more tranquil. Meanwhile, the park’s new Animal Trek program gives guests the chance to explore behind the scenes and get to know Discovery Cove’s animal residents even better, adding to the level of adventure. Both new programs have debuted just in time for the summer travel season. Guests of the new Oasis Spa enter a special spa cabana that overlooks the peaceful waters of the park’s Freshwater Oasis and indulge in a 25-minute massage performed by a licensed therapist. * The tranquil sounds of nature only add to the experience, and solo and couple’s massages are available to guests ages 18 and older. Spa sessions are available from 9 a.m. to 5 p.m. daily and are scheduled on a first-come, first-served basis as guests arrive at the park each morning. A 25-minute session starts at $59, but guests can reserve-back-to-back slots and upgrade to a 50-minute session if they prefer. Massages here are done with a special jojoba oil that has a similar pH to human skin and is non-allergenic. Best of all, though, jojoba oil is animal-friendly, which is essential at a park where the animal inhabitants greatly outnumber their human guests. 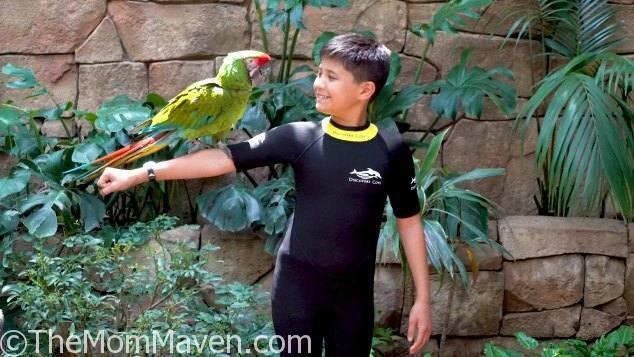 To get a better look at and a true understanding of many of those animal residents, guests ages 6 and older can join a 90-minute Animal Trek tour with Discovery Cove animal experts, who take participants behind the scenes to interact with many of the park’s birds and small mammals. The new experience includes a private tour of the Explorer’s Aviary, where guests can feed and handle birds, and a special viewing opportunity in the Freshwater Oasis, where participants have a special experience with the park’s family of playful otters. Each tour also includes the possibility of interacting with an anteater and a sloth, two of the park’s most popular small mammals. (All interactions are dependent on the animals’ interest in participating, but in general this tour will be full of great photo opportunities.) Woven into the experience are need-to-know facts about the risks of illegal exotic pet trade, bird longevity and the Species Survival Plan that is so important to Discovery Cove and its sister parks, aquariums and zoos. The experience starts at $79 per person, and guests ages 6 to 13 must be accompanied by a paying adult. There will be two 90-minute sessions each day, with each tour limited to just 12 guests. The Animal Trek is among the new experiences Discovery Cove has introduced in response to guests’ requests for more interaction with animals. Last summer the park introduced Ray Feeding and Shark Swim programs, giving guests the opportunity to spend time in the water with some of the world’s most misunderstood sea creatures. During the Ray Feeding session, which takes place early in the morning just as the park is opening, guests hand-feed playful rays and get a private tour of the Grand Reef, which is home to the rays and thousands of tropical fish. In the Shark Swim program, guests meet with the park’s shark team and get to see the animals up close, learning about their anatomy and the threats the animals face in the wild. As a second part of the experience, guests can join the sharks in the deeper part of their habitat, embarking on an exhilarating snorkel experience that allows them to swim above sharks and sometimes even come face-to-face with them. Discovery Cove donates 5 percent of the proceeds from Shark Swim to the Guy Harvey Ocean Foundation, which conducts scientific research and hosts educational programs aimed at conserving the marine environment. With all that adventure, it’s no wonder that the spa cabana has already proven to be a popular new addition to a day at Discovery Cove. For those looking for a little piece of paradise, the park is introducing 12 spacious daybeds. Starting at $79 and able to accommodate up to four people, this is the perfect place to lay out in comfort and catch some rays with your group. The park also offers private cabanas that come complete with tables and chairs, overhead fan, private locker, fresh towels, stocked refrigerator and – perhaps best of all – a cabana host who ensures your every need is met. 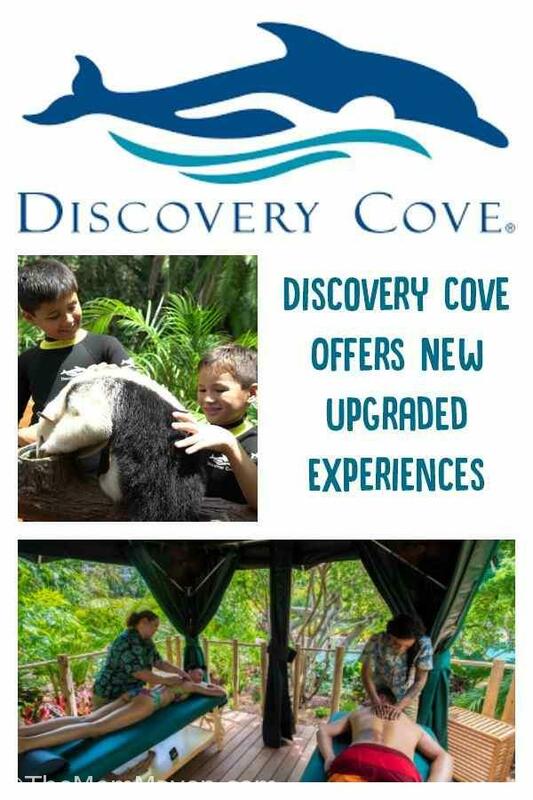 Each of these experiences adds an extra level of exclusivity to a trip to Discovery Cove, which only admits 1,300 guests each day. This paradise of rocky lagoons, tropical reefs, winding rivers, and pristine white-sand beaches is a lushly landscaped park that feels more like a secluded island than an easily accessible attraction in America’s vacation capital. A day’s admission includes breakfast and lunch, unlimited beverages and snacks, lockers, animal-safe sunscreen, snorkel gear, and parking. In addition, guests get unlimited admission to SeaWorld and Aquatica for 14 consecutive days around their Discovery Cove reservation. For additional program and booking details, please visit www.discoverycove.com. I have visited Discovery Cove once, several years ago for the opening of the Grand Reef. Discovery Cove is an amazing and beautiful place. I dream of going back there some day and doing the Dolphin Swim and the Animal Trek. I highly recommend this beautiful oasis in the middle of the hustle and bustle of a typical Orlando vacation.